I love using fresh berries for my guest breakfast. I am always looking for new things that might make a breakfast more tasty and just as important, look awesome when served. Raspberries were on sale this week, and looked so beautiful and vibrant red, so I bought some and decided to make a sauce with them to serve over my waffles on Sunday morning. As you can see, the color turned out just beautiful and made the plate come alive. 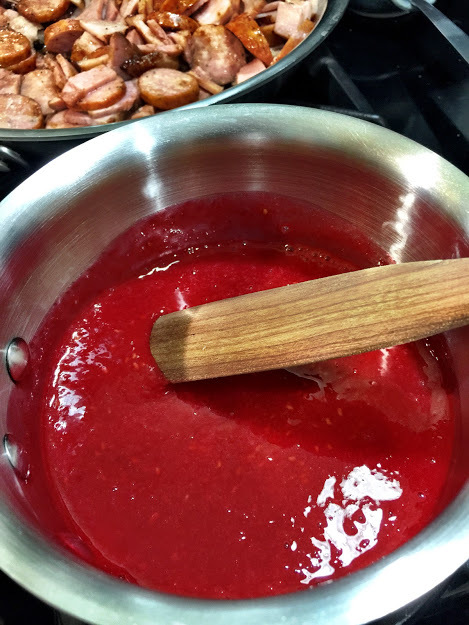 So here is a simple recipe that you can use to make a sauce from any berry or fruit for that matter. I will sure be doing this when Peaches come in season here in the Texas Hill Country. Mix this all in a blender and process, taste and adjust because berries are all different. You may want to add more sugar. You can press this through a sieve if you want to remove the seeds, but I didn’t. It can be served like this, or I warmed mine since the weather was so cold out, to keep the waffles at the best temp. Watch for berries on sale, and always look at them to make sure they are mold free when you purchase them. I hope you will try this our and enjoy them on waffles, pancakes, over ice cream or cake. This entry was posted in From the kitchen, Recipes and tagged berry recipe, raspberry sauce, waffle toppings by admin. Bookmark the permalink.